Affordable rooms with a microwave mini-fridge and free Wi-Fi get our guests interested in Days Inn San Diego. Situated close to San Diego Harbor in the fashionable downtown area Days Inn San Diego offers 44 rooms on four floors each with a microwave and mini-fridge. Free Wi-Fi keeps guests in the loop the phones have data ports and the TV features premium cable channels. For high-tech equipment visit the Internet Center at the front desk. A coin-operated laundry facility and an adjacent convenience store are additional features. Parking is free. 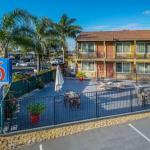 Located four miles from San Diego International Airport the Days Inn is just a half-mile from the restaurants shopping and dynamic nightlife of the downtown area. The trolley and bus stops are five blocks from the hotel. Balboa Park is less than two miles away and SeaWorld is seven miles away.